Last week I was invited for a Q&A at the ‘Ambacht in Beeld’ film festival in Amsterdam. Among the diverse program, three films on Indian textile traditions were screened. The craft sector is the largest source of income in India among rural populations after agriculture. Approximately 200 million artisans depend on their crafts for a livelihood. Since the craft sector is increasingly becoming less attractive for younger generations, the sector is threatened with the centuries-old techniques and skills of permanently being lost. Over the past 30 years the number of Indian artisans has decreased by 30% (Huffingtonpost India, 2016). The three films screened at the festival show the attention and patience the artisans have to continue their slow production processes. It depicts the dedication it takes to keep these traditions alive in this fast-paced mechanized global market. Looking at the stories of the three films, there are multiple challenges which craftsmen are facing. Traditionally these textiles were made for the local people. The craftsmen, artists were commissioned to make these textiles for local purposes, such as clothes, rituals, weddings, gatherings etc. This local demand is slowly disappearing, as cheaper clothes are available, which are easy to maintain and have more attractive colors. Further the natural resources are locally depleting and therefore more expensive. 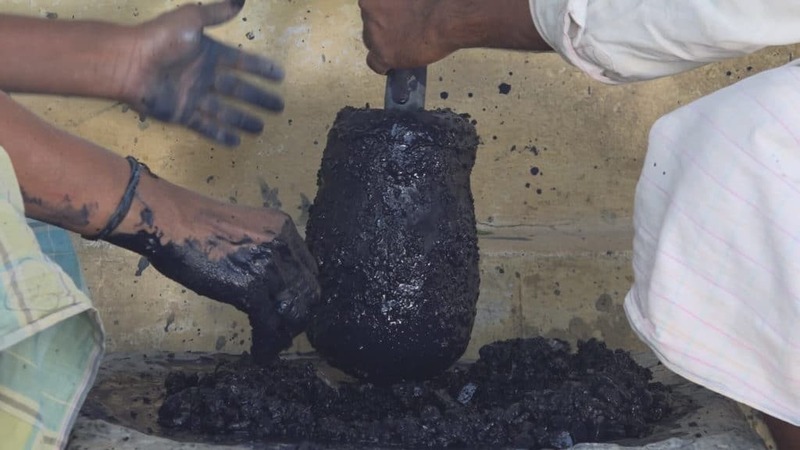 Thirdly younger generations do not want to take up this work (even though they have learnt their art from their forefathers), as there is relatively little to earn with. Above that artisans in India are often seen as laborers, rather than skilled and valued craftspeople. Women are involved in dyeing the yarns. The main colors extracted are black and maroon. Also, the craftsmen situated in remote areas have little exposure. They don’t have access to national or global markets. Originally, they only had to meet the local demand and make a few pieces per month. In order to survive the artisans, have to find new markets, which are often competing. Moreover, they have to follow seasonal trends and strict delivery times, which is not part of their natural cultural ecosystem. Such is the situation with Kotpad weaving. The weaves were made for the local tribes, which used them as saris, dhoti’s, headscarves, lungis, tuvla’s etc. The making process is all done by hand, using only organic dyes, derived from the aul tree. It takes the women approximately 15 to 30 days to process the color and dye the threads into different colors. 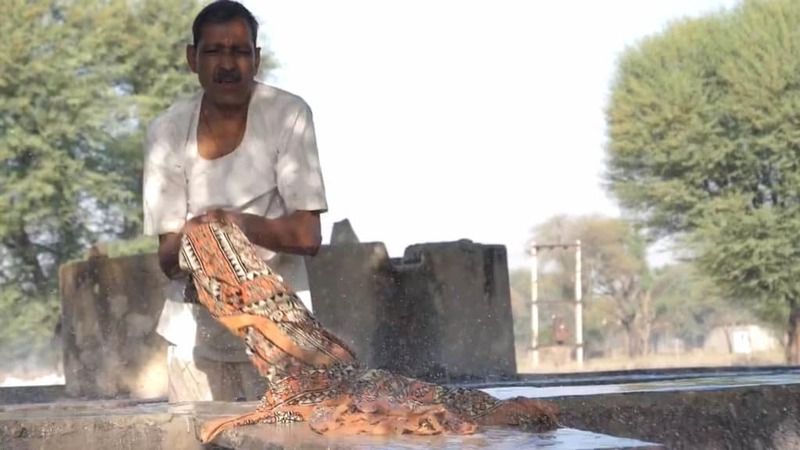 According to Prof. Dr. Sudha Dhingra, who is being interviewed in the film, there is a strong need to develop new products using this weaving technique, or it will go extinct. The Jajam’s have a very interesting history. 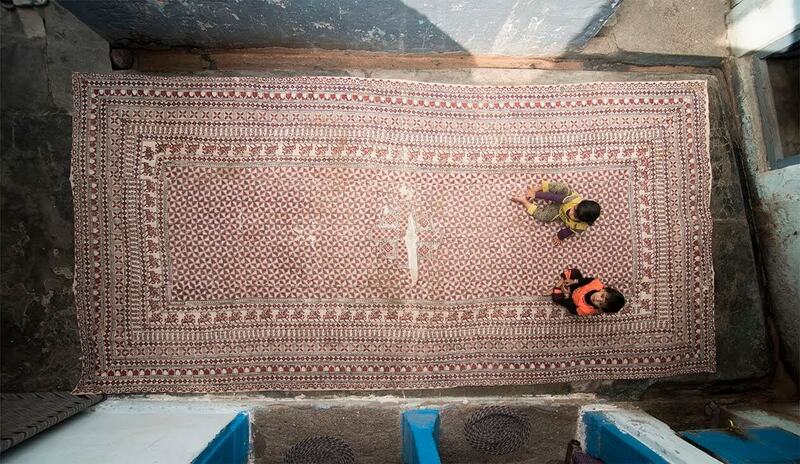 Artisans were commissioned by the villagers to make the Jajam’s as a floor covering for temples and gatherings. It was also custom to give them as a present to brides. 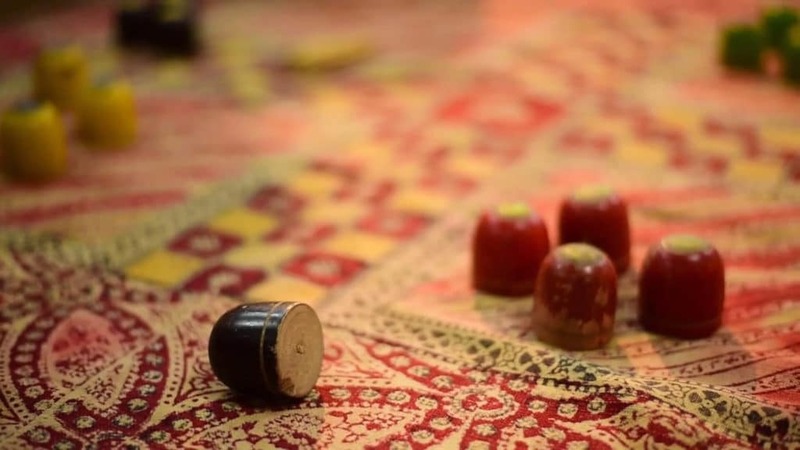 The film beautifully depicts how Jajam’s connects communities, and that rituals and songs are center to these block printed floor coverings. This craft has practically become extinct, as the demand for Jajam’s has disappeared. A handful of craftsmen are still commissioned to make them for wedding rituals as part of the tradition. 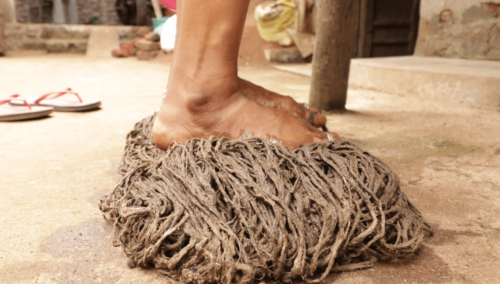 Jajam’s are almost extinct as the demand of these floor coverings have nearly disappeared. 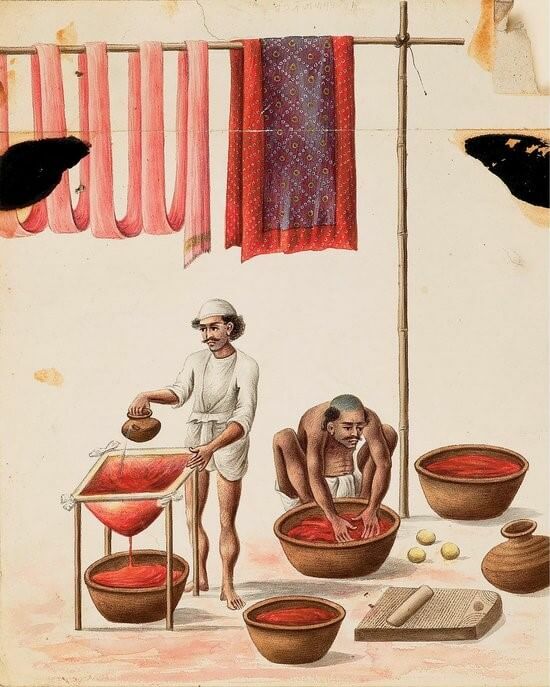 The story of indigo – True Blue follows among others, Odhelu a weaver who learnt the indigo dyeing technique from K. Yellappa (1939 – 2014). 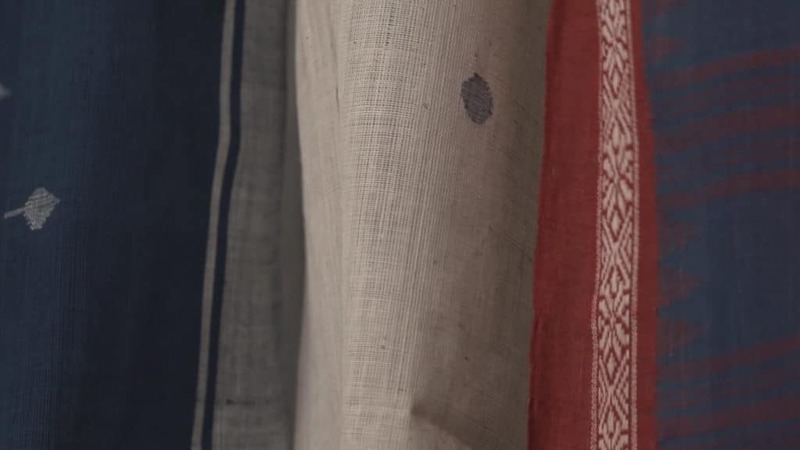 K. Yellappa was one of the few remaining indigo dyers, who learnt to work with indigo from his forefathers and was asked to revive the natural indigo by Uzramma from Dastkar – Andhra Pradesh. The demand of natural indigo had completely disappeared in 80s, whereas now the demand is ever increasing. When talking with the film director, Swati Dandekar, she explains that bulk production is not possible with entirely natural indigo, unless you set up 100-200 vats and have many people working at a time. So what is the future of all these centuries-old craft traditions? Craftsmen who are eager to continue their craft and heritage, and who are able to adapt, learn and find new markets have the possibility to survive. For those who have less exposure and are not able to go along with their time are facing extinction. Our role as Textiel Factorij is connecting craftsmen to designers so that both can learn from each other, exchange knowledge and find new markets. Kotpad weaving technique is nearly extinct. The majority of the weavers are 50 years and older. The youngest weaver is 28 years. The motifs in the weaves reflect their natural surroundings and local culture. The motifs are developed by extra wefts. Jajam’s are floor coverings used for various occasions and gatherings. 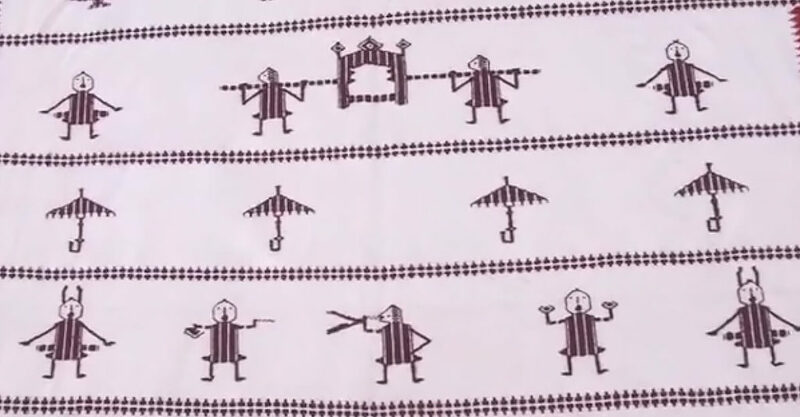 This particular Jajam was a floor covering with the game ‘chaupad’ printed in the center. Hence it had an entertaining function, where villagers would come together and play. Indigo dyeing is extremely difficult. In order to get an understanding how this dye works, one needs to learn this for at least two years from a master dyer (K. Yellappa). It is also said that indigo has it’s own will. Odhelu’s woven scarves are sold for upper-class markets in India. The Ambacht in Beeld film festival about crafts is an initiative by Wendy van Wilgenburg. These films will be online next year.